Please don’t be alarmed by the 1 star reviews, you’ll notice they were written nearly a year ago. The plugin has been getting a lot of 5 star reviews more recently and is averaging 4 stars as I write this. Please note, I’ve not been paid to write this article, my thoughts and opinions are my own. Once you’ve installed and activated the plugin you need to create a dropbox account (if you haven’t already got one). Creating a dropbox account couldn’t be easier. Just go to www.dropbox.com and create a free account. The amount of storage space you’re given is limited but sizeable at 2gb. This can be extended for free by encouraging friends to sign up as well or by paying for a pro or business account. Assuming you haven’t got a massive WordPress blog you should have more than enough room to backup your website using the free account. Once you’ve created a dropbox account I’d also highly encourage that you download and install the dropbox software on your computer. This allows you to synchronize a dropbox folder on your computer with that stored online. You’ll be able to upload files quicker by dragging files into your dropbox folder and new files will be uploaded from, or downloaded to, your local machine automatically. It’s a beautifully simple bit of software. Love it! 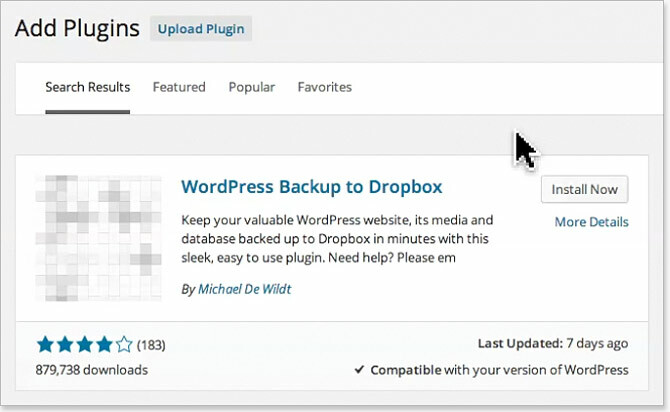 Once you’ve created a dropbox account go back to your WordPress site and select WPB2D > Backup Settings from your admin control menu. Here you’ll be asked to authorize access to your dropbox account. Hit authorize and follow the on screen instructions. Navigate back to your site and hit continue. Here you’ll be able to select a day, time and frequency for your backups. If you want to find out if it’s all going to work rather than waiting for your first scheduled backup go to WPB2D > Backup Monitor. On this page you’ll be able to start the backup process immediately. It can take a while (several hours) depending on the size of your site and the server. So hit Start Backup and brew yourself a nice cuppa, take the dog for a walk or watch a good movie. The process can be a little stop and start – I’ve found that occasionally the monitor suggests that nothing has happened for several minutes. But please be patient as it’ll reconnect itself and continue until it’s finished. The backup monitor will state Backup complete when it’s done. To be honest there isn’t really a catch – only that there are limits to what the plugin will be able to do for you if you don’t want to spend any money. If you’d like to backup incrementally rather than overriding a single backup that costs some dollars – $6.99 a year. Each backup will be zipped into it’s own folder and you can state how many you want to keep. This works a little like the Mac Time Capsule. If you’d like a nice email to notify you the backups are completing then thats $3.99 /yr. One limitation that may put off some people is that it’ll only backup one site, unless you have several dropbox accounts. Multi-site options will cost you $$$. So there you have it – I hope you found this article, ‘How to schedule WordPress backups for free!’, useful. We’d love it if you could share it with others who may benefit. Share, subscribe and add your comments below.